the necklace in the form of an oval shaped collar decorated with a delicately chased stem of berries and floral buds applied continuously over the graduated flattened rod shaped elements composing the jewel, each of which is bordered with a raised square motif pierced to accommodate the woven gold chain and applied with rows of twisted wire work, the terminal decorated with a flower head, the clasp concealed by five elements soldered as one section. 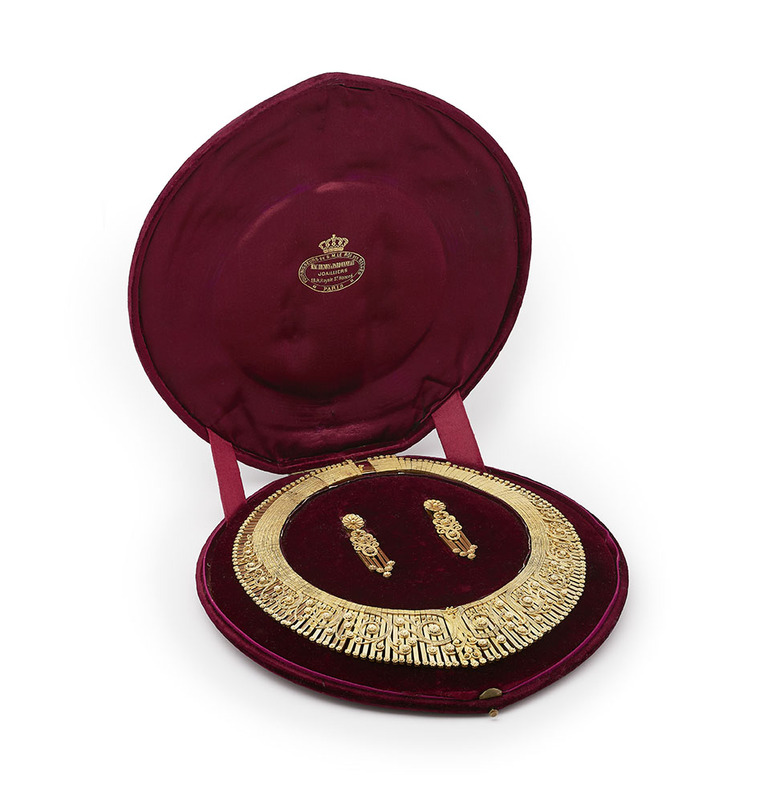 The earrings each surmounted with a large rosette from which a panel decorated with openwork twisted wirework scrolls is suspended from which hang five flattened rod shaped elements each culminating in a small rosette. Signed with the horizontal poinçon of Eugène Fontenany consisting of his initials flanking a tea urn registered on 24th July 1863 and deleted on 7th April 1880. Necklaces of this construction and decoration are extraordinarily rare. This is the very first example of a demi-parure in this taste to come to light. Contained in its original red velvet box. The lid bearing the impressed initials R.C. surmounted By a nine pointing crown indicated it had belonged to a Countess, The satin gold stamped with the retailer’s name ‘MacHenry & Pardonneau/Joailliers/18 R.Royale St. Honoré/Paris’ suppliers to the King of the Belgians, Leopold II. Eugène Fontenay (1823-1887), son of goldsmith Prosper Fontenay, founded his own workshop on the rue Favart, Paris, in 1847. By the 1850s he had achieved considerable success, culminating in the execution of a tiara for the Empress Eugènie in 1858. However, it is his work of the 1860s for which he is most renowned. 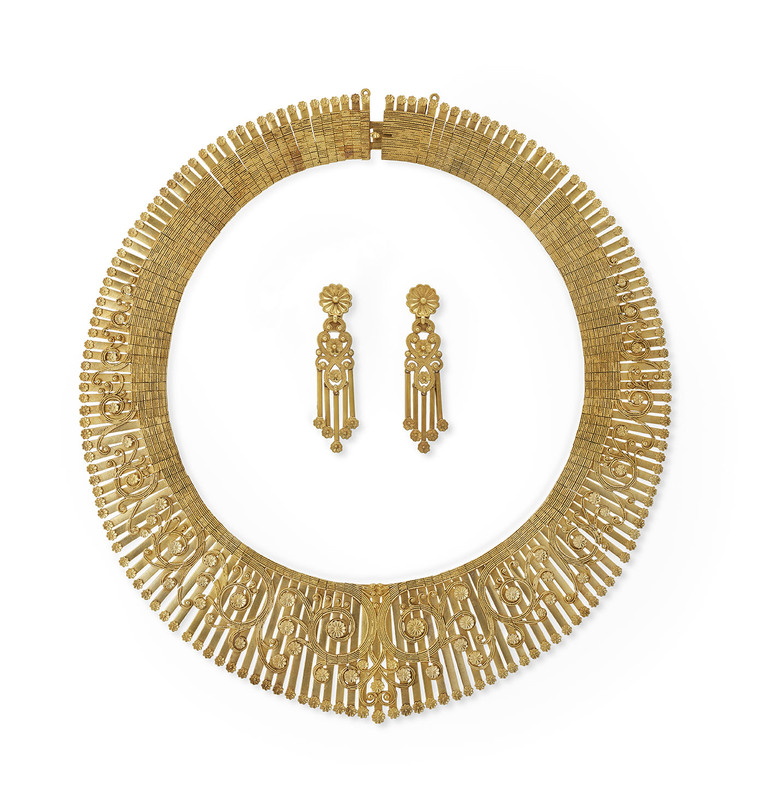 Called the “archeological style,” Fontenay’s pieces were influenced by ancient Greek, Roman, and Etruscan examples, and were certainly inspired by the 1860 arrival in Paris of the Campana Collection, ancient jewelry purchased by Napoleon III. Fontenay was a founding member of the Chambre Syndicale de la Bijouterie-Joaillerie-Orfèvrerie in Paris and was awarded the cross of the Légion d’Honneur as a member of the jury at the Vienna exhibition in 1873 as a result of his masterly Report on the goldsmiths’ and silversmiths’ work. In 1882, Fontenay retired and devoted his time to publishing numerous articles on jewelry, as well as working on his masterpiece, Les Bijoux Anciens et Modernes, published posthumously in 1887. Henri Vever in his extensive work French Jewelry of the 19th Century, described Fontenay as a “man of distinction and rare intelligence, of great discernment and impeccable taste. A true artist and a distinguished writer, he handled a pen as skilfully as a paint brush.” See Vever, translated from the French by Katherine Purcell, p. 642.